OTTAWA - Insurance executives say homeowners will never have access to comprehensive flood insurance in Canada unless there are new maps of flood-prone areas that take climate change into account. That's the finding of a study that surveyed senior executives at 13 Canadian insurance firms on extreme flooding, which devastated parts of southern Alberta and Toronto this year and is becoming more frequent across the country. "Most insurers agreed that existing flood maps are inaccurate, outdated and inadequate for insurance purposes," says the study by two experts at the University of Waterloo, Ont. "This data gap poses a clear threat to the viability of flood insurance." The insurance industry is sharply focused on flooding, which in the last 15 years has become their biggest payout area. That's because of extreme weather events that the executives agree are linked to climate change. "The big cost now ... is flooding basements, by a country mile," said Feltmate. "So it's really high on their radar screen." Existing sewage-backup coverage is also hurting private insurers' bottom lines because climate change results in more torrential downpours that overwhelm aging municipal infrastructure and can't be absorbed by an ever-more-paved urban landscape. Executives would consider offering overland-flood insurance, says the survey, but can't begin to draft policies or set premium levels until proper maps accurately identify the new risks arising from a warming planet. "We need new flood-plain maps that take into account not the historical weather but the weather that can be expected going forward," said Feltmate. Feltmate says the next phase of his research is a year-long survey of mayors, town councillors, premiers and others who will have to become part of Canada's flood solutions. 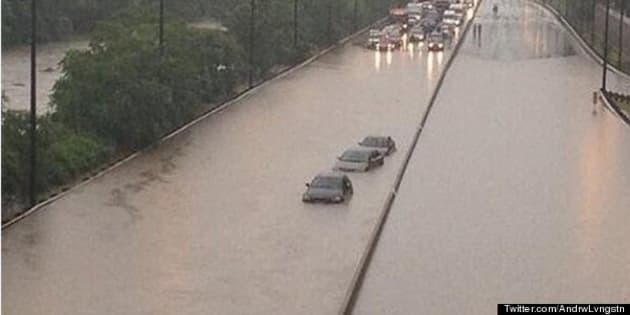 That's because mortgages are contingent on a homeowner obtaining insurance, and many insurance companies may begin to steer clear of properties prone to frequent basement flooding, such as in the Downsview neighbourhood. "The banks have a much greater stake in this game than they currently realize," said Feltmate.